At its height, the empire stretched from the borders of Egypt to the Persian Gulf, and to Mount Ararat on the north. King Adadnirari II's assent to the throne in 911 B.C. was the climax point of Assyrian civilization. Assyrians celebrated their success by building huge palaces. Assyrian kings were brutal rulers, however. They ruled subject lands with such cruelty, that more and more groups rebelled against them. These rebellions eventually destabilized the empire and led to its downfall. In 612 B.C. 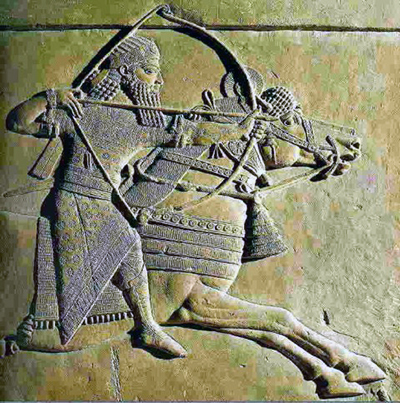 Assyria was invaded by Medes and Babylonians. A good demonstration of Assyrian kings' pride is recorded in II Chronicles in the Bible, when Sennacherib came with a huge army to conquer Israel. In his speech to Israelites, he basically boasted about been the boss of all kings and gods, and that the God of Israel would be no different. Eight years prior, he sacked Babylon, and rightfully felt powerful. But the God of Israel heard king Hezekiah's prayer, and saved Israel from this particular conquest. Sennacherib's army was annihilated by an angel, and Sennacherib was forced to retreat home alone and in shame. When he returned home, and was at the temple of his gods, his son Esarhaddon murdered him, and took over the throne. That was in 681 B.C. In 612 B.C., after a three-month siege, the capitol city Ninevah and other cities of Assyria were sacked by a coalition of Babylonians with other subject peoples.